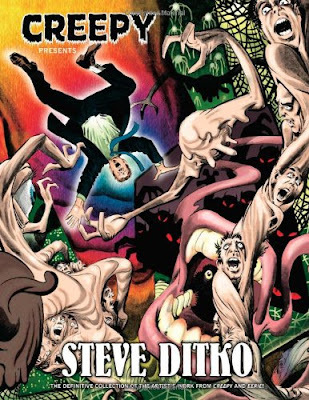 In the pleasant surprise department, Dark Horse has their CREEPY PRESENTS STEVE DITKO book set to come out in comic stores tomorrow, two weeks ahead of the scheduled date. Presumably copies from Amazon and other vendors will follow in short order. For those into digital, there's also a Kindle edition coming out for $10, and it's a pretty good bet that Dark Horse will have it available on their own digital store, like the previous Wrightson and Corben volumes, probably for about $12. As discussed before, this book collects, for the first time in one volume, the sixteen stories drawn by Ditko for Warren's CREEPY and EERIE from 1966-1967, fifteen of them written by Archie Goodwin, the other by Clark Dimond and Terry Bisson. It was the first major body of work that Ditko did for black-and-white publication, and he used a variety of techniques to create some of the most visually arresting work of his career (that cover image gives you a taste, though I'm not wild about that colouring job). You can see posts about some of the stories in previous entries on this weblog. I do want to point out that, based on a look at some of the EERIE ARCHIVES and CREEPY ARCHIVES books that reprint the full issues these stories appeared in (meaning you'd need to get five $50 hardcovers to get all of the Ditko, making a single $20 book much more attractive), it doesn't appear that whatever path led the publishing rights to these stories to Dark Horse included the original artwork or high-quality first-generation stats of the artwork to reprint from, so as far as I can tell the reprints are based on printed copies of the actual comics. The production work seemed to be top-notch given the limitations inherent in reprinting from that kind of source (and it's a better option for b&w comics compared to colour comics), but as those who've seen samples of Ditko's original artwork for some of these stories (whether on what Ditko once termed the "comics thieves market" or elsewhere) are aware there was a level of detail in Ditko's work that Warren's printing of the day couldn't capture. So buyer beware, maybe not the best printing you could hope for of these stories, but likely the best you'll ever see, at least of all the stories under one cover.